Even though vinyl windows are virtually maintenance free, proper care of them is important. With some simple routine cleaning and maintenance, you can ensure your windows will perform their best while looking great. 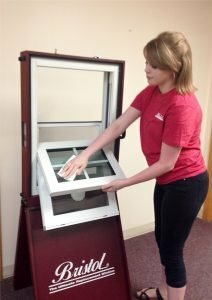 From frame cleaning to the drainage systems, light attention to your vinyl windows will generate a lifetime of satisfaction. You may think that window cleaning is only for glass, but frame cleaning is just as important to the look and performance of your vinyl window or patio door. Wash window and patio door frames with mild, nonabrasive soap and water. Never use abrasive or acidic cleaners because they might cause permanent damage to the frame finish. Always test cleaners in an inconspicuous area first. Wipe dry when finished. Whether your window comes standard with the energy efficient SolarBan-60 Low-E glass, or one of our many specialty glass options, proper maintenance is required to ensure their exceptional performance. Clean glass with a mixture of mild dish soap and water. When finished, rinse completely with clear water and wipe dry with a soft cloth. Never use petroleum-based cleaners or caustic chemicals; razor blades, putty knifes or abrasive pads; high-pressure water hoses on any part of your window or patio door – they may damage the glass surface or insulating seal. Use only mild soap, water, and a soft brush when cleaning your screens. When finished, rinse with clear water and wipe dry. Following a few simple steps, you can ensure your vinyl window or patio doors will open, close, lock and unlock smoothly for as long as you own your home. It is important to make sure your window and patio door seals evenly when closed. Regularly check your weather-stripping to ensure your window or patio door is sealed airtight. Vacuum the tracks on all sliding patio doors and windows to clear any dirt or debris. Your sliding patio door rollers can be adjusted for proper height clearance. Carefully use a screwdriver through an access hole at the bottom of your patio door. 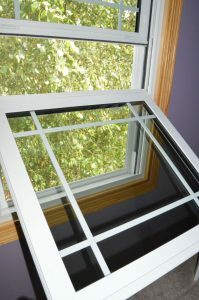 Check all window and patio doors for smooth operation and that they are sealing airtight. Use a ceiling fan to continually circulate air. Dehumidifiers can drastically reduce the amount of moisture inside your home. When practical, open all windows and doors when experiencing excessive moisture inside your home.